The Star’s Sheffield United reporter, James Shield, runs us through tonight’s potential teams, the referee and the player to watch as the Blades prepare to take on Tottenham in the Capital One Cup semi-final second leg. Sheffield United: Howard, Flynn, McEveley, Basham, Harris, Doyle, Reed, Scougall, Murphy, Campbell-Ryce, McNulty. Tottenham: Vorm, Walker, Vertonghen, Dier, Rose, Dembele, Paulinho, Eriksen, Stambouli, Kane, Soldado. Christian Eriksen, the Denmark international, has scored eight goals in 32 appearances for both club and country this term. Five of those eight strikes have come away from home. Having started last weekend’s FA Cup tie against Leicester City on the bench, the 22-year-old is expected to enjoy a more prominent at Bramall Lane tonight. Eriksen, Tottenham Hotspur’s reigning player of the season, won three Eredivisie titles with Ajax before moving to London. He played under Pochettino’s predecessor Martin Jol during that spell in Amsterdam. Nigel Clough’s players are bidding to become the first Sheffield United team to reach the final of this competition since its inception in 1961. Tottenham Hotspur, meanwhile, have contested the trophy on seven occasions. The visitors, who head to Bramall Lane boasting a slender 1-0 advantage, have never lost an away leg on each of the four occasions they have gone on to lift it. The last of those was in 2008 when reigning champions Chelsea were beaten 2-1 at Wembley. Mike Dean: The Wirrall based official averages 4.3 cautions per game this season and has sent-off five players since August. All of those dismissals have come in Premier League or Championship fixtures. 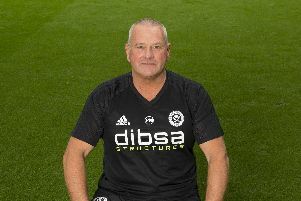 Dean, who oversaw the final of this competition in 2011, will be taking charge of his first match at Bramall Lane since April when Nigel Clough’s side beat neighbours Rotherham United 1-0. Bob Harris was the only home player booked.